It's finally feeling like fall down here in Dixie. Don't you just love this time of year? The weather hadn't gotten the memo here in the South until today - we've been in the mid-80's for a few days. So, in celebration of cooler temps and pumpkins and apple trees and bouquets of sharpened pencils (LOVE! Fave movie. 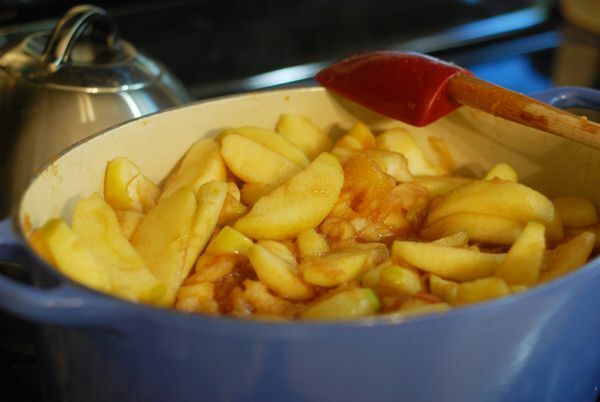 ), I'm sharing my recipe for Homemade Applesauce. 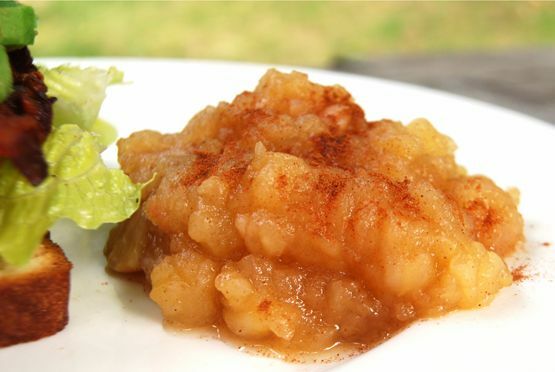 This is the perfect time of year to make and freeze applesauce to have all year round. Homemade applesauce on a cold January day when apples are a fortune to buy? Basically every main dish on earth? 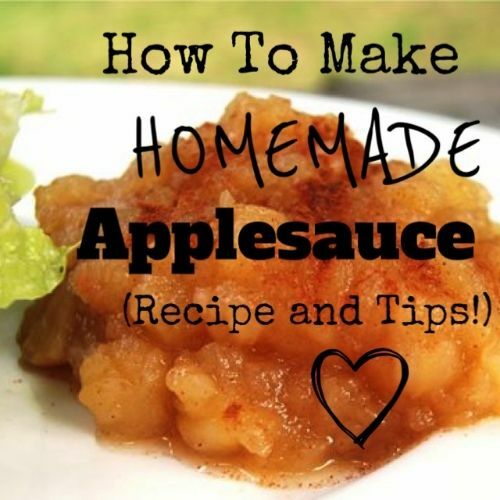 Today I'm sharing my recipe for Homemade Applesauce - along with some tips for storing and freezing, how to customize your applesauce to your liking, and how to get your kids involved in the process. If you've never made homemade applesauce, it is so much more delicious than what you buy pre-made in the store. It's wonderful served warm, next to a roast and some potatoes (or any of the above), or alongside your favorite sandwich (which for me happens to be a BLT!) And, it's a great snack for kids. PLEASE let this inspire you to try making your own homemade applesauce at least once this fall. I promise it'll become a favorite in your house! 1. Buy a box of gallon or quart-sized freezer bags. Triple or quadruple this recipe. Place the applesauce into family-sized portions into the freezer bags and save for the winter. Or give away to family and friends! 3. Have it the way you like it. I love chunky applesauce. But, many people prefer it smooth. If you want smooth applesauce, place it into a food processor or blender and pulse until smooth. This is also a perfect way to make applesauce for baby food - just eliminate the lemon peel and sugar. I used to make this applesauce only with lemon, but one day discovered how much I LOVE it with orange peel. SO delicious. I really love it both ways. 4. This is a great activity for kids. 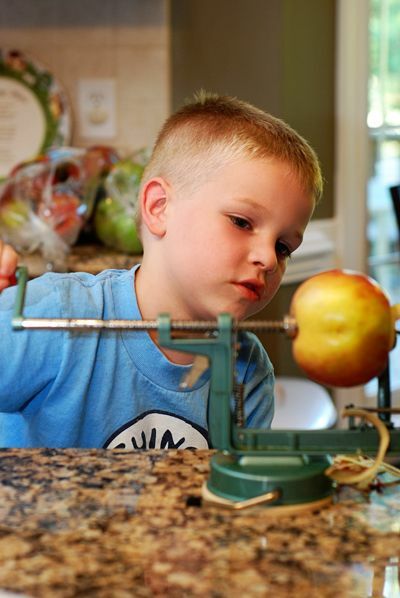 My boys LOVE to work my apple peeler/corer. (HUGE timesaver when making large batches of anything apple.) 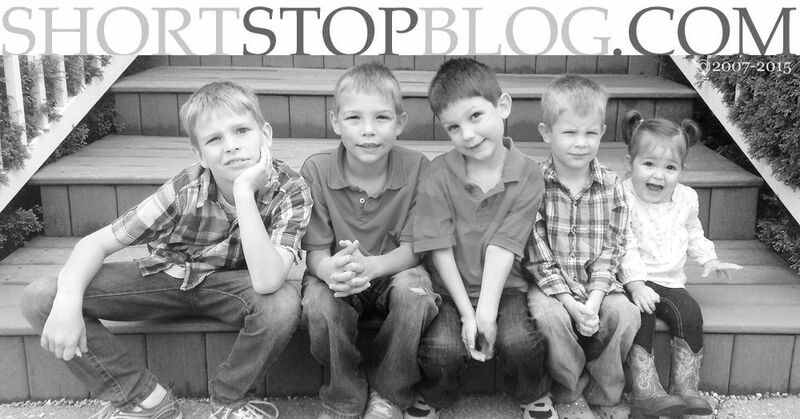 Look how little they were in these older photos! Little buddies. Growing up so fast. 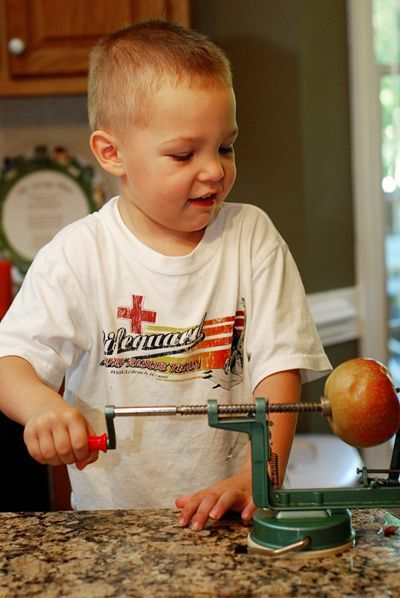 Kids can also wash the apples and add ingredients to the pot. My boys love to use measuring cups to help scoop the applesauce into the freezer bags. And, tasting as they go along is part of the fun! I hope you'll try to make homemade applesauce this fall - even if only once. It's such a delicious treat to have ready in your freezer all winter long. My mom always made homemade applesauce and it's just not something I think about doing, but this has inspired me! Yum! and thank you! We use orange peel also, but in a different way: We wash the orange, peel it and cut the peel into quarter-inch squares. We then boil the peel in a cup of water and a cup of sugar until translucent. We add the peel and the sugar water to the applesauce. The little sweet chunks add a little flavor surprise. We also sometimes do the peel in long strips, drain it, and then dip in melted chocolate for homemade orange sticks.